Better audio, sturdier design, and a more refined look. After the release of this year’s Man O’ War headset, I figured it was only a matter of time before Razer got around to updating its more mass-market design—it came even faster than I expected. Just in time, too. 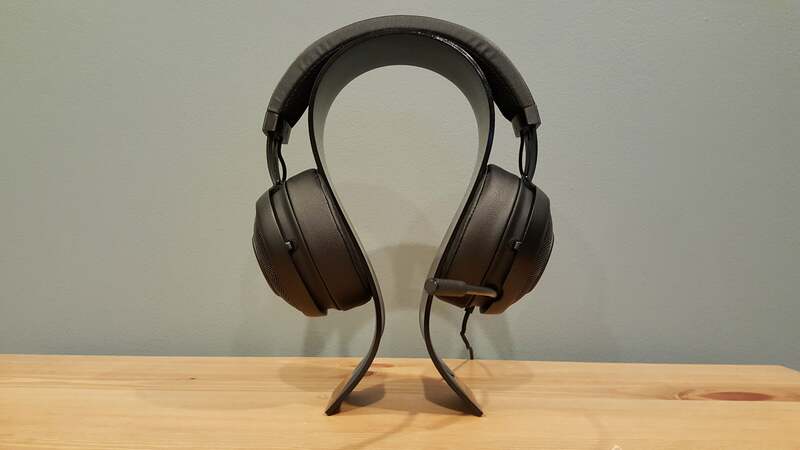 The Kraken 7.1’s been an also-ran for years now, a chintzy headset backed by underwhelming audio. The 2016 Kraken V2—both the analog Pro variant and especially the USB-powered 7.1 V2—changes that, arriving packed with most of the Man O’ War’s improvements: better audio, a sturdier design, and a more refined look. Sure, it’s just as bulky as ever, but this is the Kraken’s best showing in a long time. If Razer had only changed the Kraken V2’s aesthetic, it’d already be a huge improvement over last year. Some people might really love the Kraken’s old street-punk style, with its DayGlo colors and scratched-out logo, but I always thought it was a bit out of sync with the rest of Razer’s products, especially in the last three or four years. The Kraken V2’s look is a total visual overhaul. It’s now black everywhere: on the ears and headband, plus an upgrade to black aluminum for the earcups and chassis. 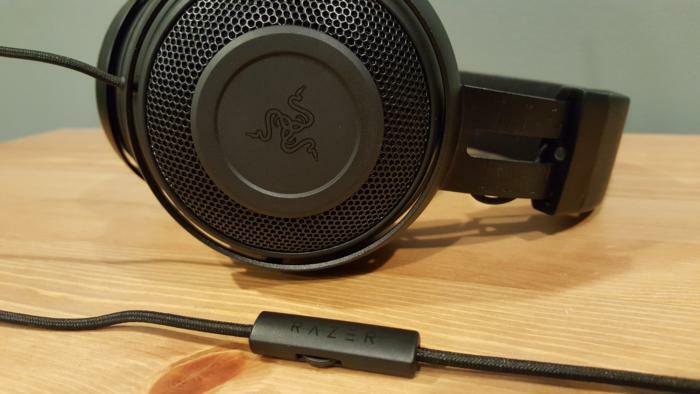 The branding’s also the same shade, with the new, subtler Razer logo embossed right into the headband. Logos matter, and you can see it in the Kraken. The headband branding is the only design difference between the Kraken V2 and its predecessor, but it has a positive effect. The Kraken previously felt like some bargain peripheral, something left on a shelf in a Best Buy five years ago. This latest iteration pivots towards a more refined adult look. It’s a smart move. Not only have other manufacturers like Logitech and SteelSeries already made the same shift, but it brings the Kraken aesthetic in line with the rest of Razer’s products. Not that the Kraken V2 is a perfect design. It’s still much bulkier than any headset I’ve reviewed recently, with the exception of Razer’s own Man O’ War. And just like the Man O’ War, the Kraken gives you that bizarre Princess Leia side-bun look. A few differences separate the USB-enabled Kraken 7.1 V2 and its less-expensive analog cousin, the Kraken Pro V2. The Kraken 7.1 V2 features RGB lighting on each ear, with an illuminated Razer snake logo. It also has a red band around the end of the retractable mic to indicate whether you’re muted—a function controlled by clicking the end of the microphone. The Pro V2 has zero lighting. No decorative ears, which is fine, but sadly no mute indicator, either. However, the Pro V2 does have a control box located about a foot down the cable with a volume wheel and a mute toggle. I’m not a huge fan of in-line boxes, preferring controls on the headset itself, but the weird bit is that the USB-enabled 7.1 V2 lacks any sort of on-the-fly volume controls. This gives the Pro V2 a slight edge in my book, as I like to have volume controls handy. Also worth noting: The Pro V2’s cable is way longer, at least if you connect the dual-terminus (mic/headphone) 3.5 mm cable. The USB version’s 6-foot cable can feel a bit limiting by comparison. The biggest change to the Kraken V2 can be found under the hood: 2016 marks the first use of 50mm drivers inside. 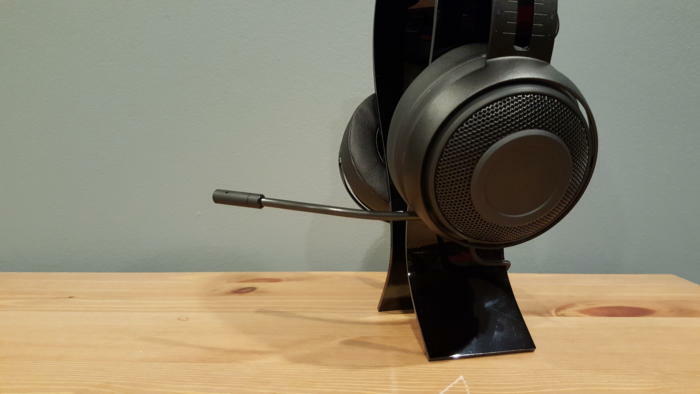 The Kraken’s one of the last gaming headsets to move to the larger size. Ostensibly, the switch to 50mm drivers over the past few years has been to facilitate bass quality and provide a “larger” sound, though it’s worth pointing out that a good 40mm driver will outperform a weak implementation of a 50mm driver. Still, it’s an important change for the Kraken, which has been plagued by middling audio for years. The Kraken now hews much closer to the Man O’ War, a headset I found rather enjoyable. Like the Man O’ War, the Kraken on its default setting isn’t fantastic. It leans a bit heavy on the mids and treble range, without much of the bass punch you’d expect from the jump to 50mm drivers. Simple music like most of Julien Baker’s piano-and-voice songs or some of The Band’s ouvre sounds fine, but more complex mixes seem a bit lifeless. Everything blends together into one narrow band of sound. But like the Man O’ War, the Kraken’s strength lies in its EQ headroom. Swapping between the various EQ presets included in Razer’s Synapse software can make a huge difference. When I changed to the “Rock” setting and rolled off the bass a bit—the same settings I used with the Man O’ War a few months back—the sound opened up considerably. I got better bass, a more distinct treble range, and the same solid mids as the default setting. A few things here: 1) Yes, it’s still weird that Synapse’s EQ settings are named after music presets instead of games. 2) Yes, I’d prefer if the Kraken 7.1 V2 was a better headset out of the box, as every headset can obviously benefit from EQ tweaks. The difference here though is the degree by which the Kraken changes. Also, it’s a $100 headset, so I’m a bit more forgiving than I am with, say, the $300 Astro A50. If you’re considering the analog Kraken Pro V2, keep in mind that the default audio is more of an issue. To adjust how it sounds on your PC, you’ll need to run your own separate EQ software. And if you don’t bother, or if you hook the Kraken Pro V2 to a different device like your phone, you’ll notice again that the Kraken’s default sound just isn’t that great. It’s fine, but there are better options out there. You’ll also miss out on the Kraken 7.1’s titular surround-sound support, though that’s less an issue. The Kraken 7.1 V2 doesn’t quite match the Man O’ War’s soundstage, but it’s still pretty wide output compared to most sub-$100 headsets—with the exception of the HyperX Cloud. That said, 7.1 isn’t much of an upgrade. 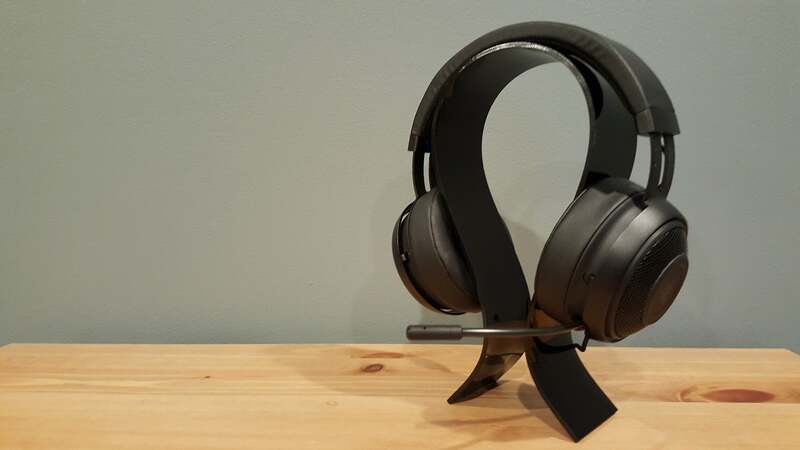 I’ll repeat my old fallback phrase: “It’s good, for a headset.” You can calibrate the Kraken’s 7.1 audio through Synapse, and yeah, it definitely does a decent emulation of surround sound—about as good as Logitech’s similarly priced G633. But it’s a far cry from real surround setups, and I prefer to run in stereo mode most of the time. Props to Razer for making that fairly foolproof, though. Like the Man O’ War, the Kraken 7.1 V2 lets you set preferred output through Synapse, meaning you can set Spotify to always default to stereo while games run in 7.1. It’s a small but convenient quality-of-life upgrade. As for the microphone, the Kraken 7.1 V2 is the clear winner between it and the Pro V2. It’s got a better-quality mic than the Kraken Pro and a bunch of optional tweaks built into Synapse, including active noise cancellation and noise gating. I miss the Man O’ War’s dedicated microphone volume wheel, but the Kraken 7.1’s still got the same features in software and does a good job reproducing voices. The Kraken Pro’s a bit worse off, with a noisier microphone and more nasally sound, but it does get the job done. I’d love to see Razer slim the Kraken down a bit, and add some sort of volume control (even in-line). 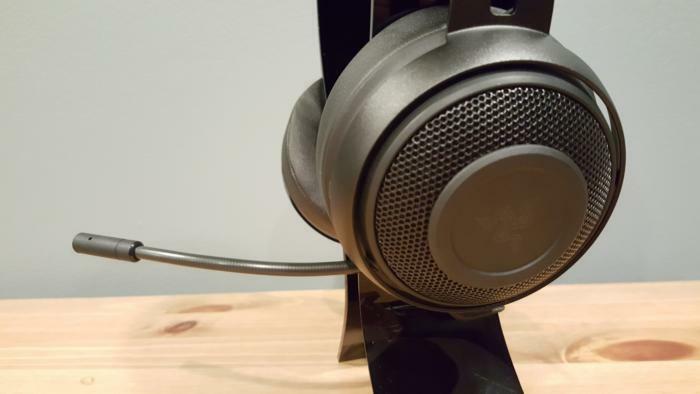 But for the first time in a long time, the Kraken feels like a viable midrange headset choice. 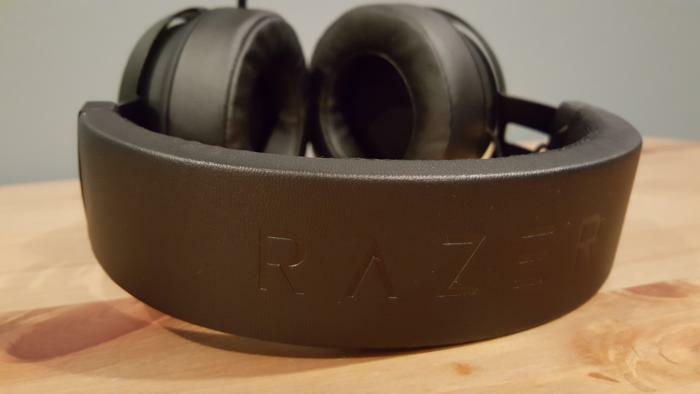 That’s good news for all the Cult of Razer folks.